My younger, street-skating self would've scoffed at the idea of an electric skateboard, at least one that wasn't built for tricks while in transit. But having spent less time doing slappies and ollies in recent years, taking to the streets on an electric version finally seemed a viable alternative. For those who aren't planning stunts along the way, or perhaps have less experience skating, there's something to be said for an electric that focuses on cruising and getting you from A to B at a controllable pace. So when I was offered the chance to test one of Boosted Boards' Dual+ 38-inch setups, I decided it was time to take one for a spin. Starting at $999, they're clearly a luxury item, and it's not every day you get to take one for an extended test-drive. Sure, winter and its bone-chilling cold were rapidly descending on New York City when it arrived, but that never used to stop me back in the day. I did get to ride it in the warm Las Vegas sun during CES, but I never managed to use it as a commuting alternative with the weather in decline. The time I managed to spend on the board, though, was definitely worth it. I've tried a couple different electric boards recently, including Boosted's Dual+, the ZBoard 2.0 and the LEIF. While they're all fundamentally the same, each is a slightly different creature. 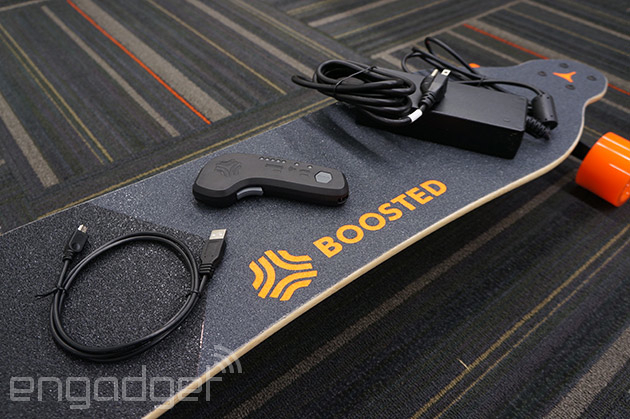 The Boosted series (which was successfully Kickstarted in 2012) uses a longboard-style setup and a Bluetooth controller that handles movement and monitors battery life for itself and the board. The LEIF is a freeboard with two additional rotating wheels underneath to help you drift like a snowboard; as for accelerating, you've got a hand-held radio controller (although it's still under development). The ZBoard 2.0, meanwhile, is an oversized street/ramp style deck with pads you step on to control forward and backward motion. The hand-held controls aren't ideal in the cold -- wintry weather can quickly freeze your digits and gloves make them awkward to use -- but Boosted has the most comfortable user interface out of the bunch, at least for me. Boosted Boards has three models in its lineup: the $999 Single, the $1,299 Dual and the $1,499 Dual+. All of them come kitted out with a bamboo deck that provides plenty of bounce and a comfy ride, and a set of soft, grippy 80A durometer wheels to give you traction while carving. Both the Dual models are out now and the Single (the lightest of the three) is expected to arrive at the end of January powered by a single 1,000W motor. It offers the most range out of the bunch and is built to be more portable, but you sacrifice some power. The top-of-the-line Dual+ offers two brushless motors totaling 2,000 watts and can tackle a 25 percent incline with gusto. After decades of riding skateboards, I'm comfortable barreling down the road on one at high speeds, so the Dual+ model is the one I'd recommend. Cruising at 20MPH is fast for a skateboard -- I even managed 25MPH at one point -- but once you get used to it, top speed will feel pretty casual. Don't worry, though, it'll still satisfy your inner Ricky Bobby and this thing has a lot of torque right out of the gate, enough that you'll have to lean into it or get chucked off. The Dual+ also includes adjustable speed settings, letting you slow it down for newbies or save power when you want to max out the range. If you're not worried about tearing down the road at top speed, the other models may be worth the savings. 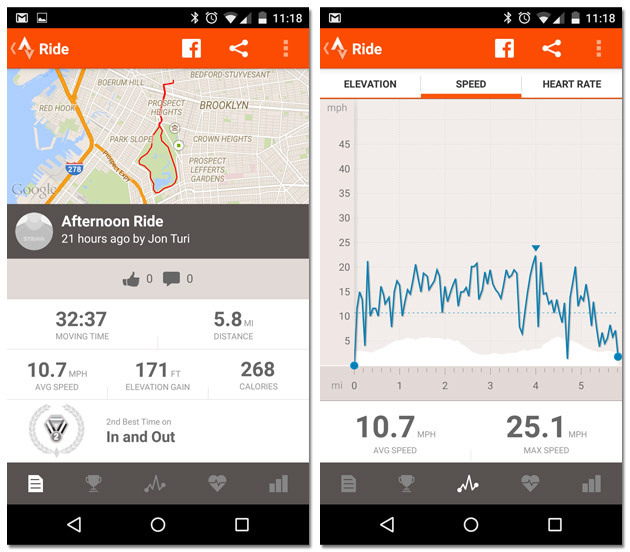 Cruising around the neighborhood, I managed to cover about 5.2 to 5.8 miles until the power was depleted (usually with the pedal to the metal) and since the regenerative "brakes" actually feed energy back into the battery, my hilliest ride also gave me the most distance. Being able to dial back your speed when shooting down a hill is a wonderful thing, especially when it gives you a chance to charge the battery (at least a little bit). 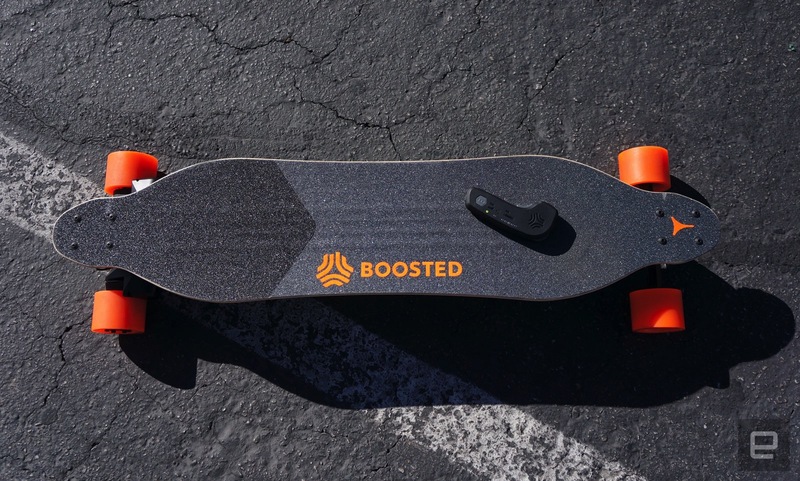 Range-wise, Boosted's ride falls short of ZBoard's proposed 24 miles (with its Pearl edition), but the motors and the style of ride you get differ a good deal between the two. With five to seven miles on a charge, you could easily commute to work if it's in range. The company's CEO and co-founder Sanjay Dastoor was also quick to point out that while these boards aren't cheap, if used daily, the money you save on trains and buses could end up balancing out the initial expenditure (and then there's the fun to be had). Also, once you reach your destination, you won't even have to worry about locking up or parking. That portability depends on how much you're comfortable carrying around, though, which is why the company is releasing the Single. The Dual models both weigh about 15 pounds and while that may not sound like much, they seem to get heavier the longer you carry them. With the battery's inherent limits, you'll likely want to sling it over your shoulder or carry it at your side at some point, since pushing this thing when the battery has died is a bit of a pain. You can do it, but you're going to have to work at it. On the plus side, if you purchase the additional 120W fast charger to take on the road, you can get the lithium iron phosphate 99Wh battery up to around 80 percent after only 30 minutes charging (the bundled charger takes an hour for 90 percent). It would mean carrying the laptop-style brick in your bag, but plugging in while you grab a coffee is easy enough to accomplish, and you could cruise around for a good part of the day with some planning. It's important to mention, though, that taking this thing on a bar crawl is probably not a good idea. 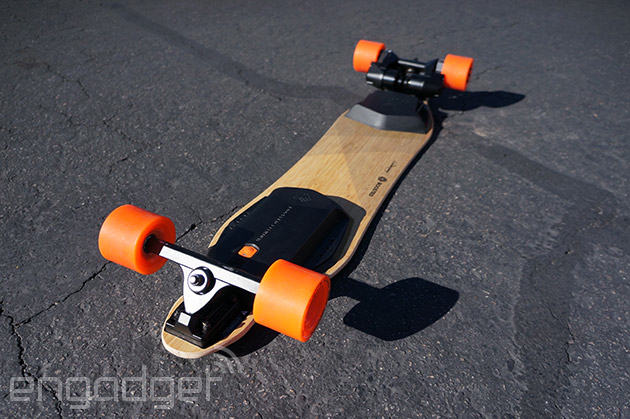 So, the elephant in the room here is: Are these electric skateboards worth $1,000 or more? That's a tough question, but if money isn't an object, I'd say yes. An electric skateboard certainly won't have you flashing back to those day-long curb sessions, but for straight-up cruising and tasting a bit of today's technology, it's a treat. That's especially true of the Boosted line, which I've found to be well-built and fun to ride. If you live in a sunny and warm climate, this could be a great way to commute -- and you'll barely break a sweat. The flip side is that it barely registers as exercise (you're mostly standing in one place) and won't help you reach your daily fitness goals. Boosted Boards has been known to call its product "Hoverboard 1.0" and while that honor may already be claimed, it's certainly close enough. Being able to skate around with some horsepower under your feet is definitely a trip and the onboard motors offer sci-fi sound effects as you're thumbing the accelerator or slowing to a stop at your next destination.